California is the most populous state in the United States with a population of 38,000,000 and is home to 1 out of 8 Americans. 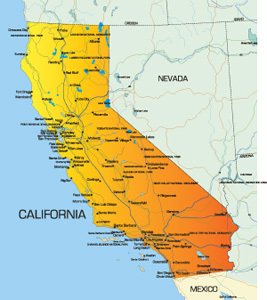 California is bordered by Oregon, Nevada, and Arizona. By being a border state as well as a coastal state, California has been heavily influenced by immigration which has created a unique west coast culture with several different ethnicities all in one melting pot. The major highways servicing the state are I-5, I-8, I-10, I-15 and I-40. Other famous transportation venues are Los Angeles International Airport, LAX, and The Golden Gate Bridge. There are hundreds of universities in California including the University of California (UC) System and universities like UC Berkley and UC Santa Barbara. Three cities have professional sports teams and stadiums: Oakland, San Francisco, and San Jose.